System 15 is designed for the majority of low-rise and light commercial applications where DWV systems don't run through air plenums. CSA certified Schedule 40 pipe and fittings connect fast and easily using solvent cement. 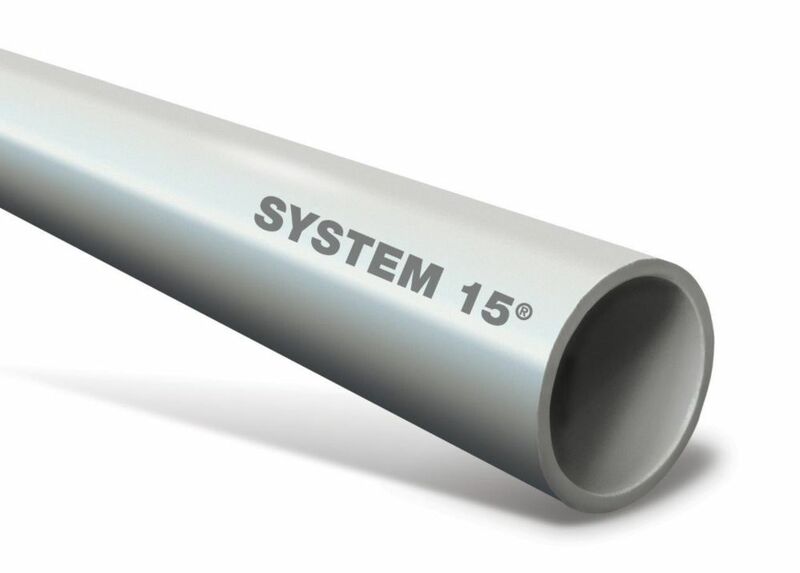 System 15 won't rust, pit, scale or degrade, even under continued exposure to moisture, salts, aggressive soils and most acids. Interior and exterior walls remain smooth, ensuring years of reliable, maintenance-free flow. Grey colour PVC and System 15 labels on all fittings provides easy identification of the DWV system. For product warranty details, see the Warranty and Limitation of Liability section under Terms and Conditions of Sale at www.ipexinc.com. You can also make Warranty inquiries through IPEX HomeRite Products Customer Service 1-866-777-8023. Perforated wall sewer pipe. Certified Ecologo and ECO OPTIONS product. Inner layer made up of at least 50% recycled PVC. CSA certified for building sewer applications as well as building and landscape drainage. Cuts easily with plastic pipe cutters or saws and connects using PVC solvent cement. Solid sewer pipe. A certified Ecologo and ECO OPTIONS product. Inner layer made up of at least 50% recycled PVC. CSA certified for building sewer applications as well as building and landscape drainage. Cuts easily with plastic pipe cutters or saws and connects using PVC solvent cement. IPEX HomeRite Products PVC 4 inches x 10 ft SOLID SEWER PIPE - Ecolotube NS Spec. Perforated sewer pipe. A certified Ecologo and ECO OPTIONS product. Inner layer made up of at least 50% recycled PVC. CSA certified for building sewer applications as well as building and landscape drainage. Cuts easily with plastic pipe cutters or saws and connects using PVC solvent cement. Conforms to Nova Scotia specifications. 1 1/2 inch X 6 ft. PVC DWV Pipe System 15 is designed for the majority of low-rise and light commercial applications where DWV systems don't run through air plenums. CSA certified Schedule 40 pipe and fittings connect fast and easily using solvent cement. System 15 won't rust, pit, scale or degrade, even under continued exposure to moisture, salts, aggressive soils and most acids. Interior and exterior walls remain smooth, ensuring years of reliable, maintenance-free flow. Grey colour PVC and System 15 labels on all fittings provides easy identification of the DWV system.